Air Nostrum, Iberia Regional, operates as a franchise carrier for Iberia. It currently uses a fleet of around 70 aircraft and has orders for 50 more. The airline operates flights to more than 50 destinations for a total of around 100 routes. 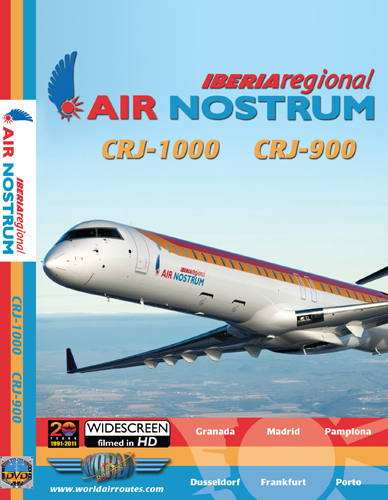 Air Nostrum was the launch carrier for the CRJ-1000 and first to place an order for the aircraft in 2009. It recently started taking delivery of the aircraft and has ordered a total of 35. It is operated with 100 seats. The aircraft first flew in late 2008 and was awarded its operating type certificate at the en of 2010. Air Nostrum was also the first airline to take delivery and place the aircraft into revenue service in 2011. The cockpit is nearly identical to the CRJ-900. The CRJ-1000 has a wingspan of 26.17m and incorporates a redesigned wing-tip, winglets and an optimised wing leading edge to provide a lower lift-to-drag ratio and allow reduced approach speeds. 216 mins. Tuote on lisätty luetteloomme tiistaina, 16. elokuuta, 2011.